May | 2005 | That Mall is sick and that Store is dead! Does anybody remember BEST? I’ll give my reader a second to recover from bad flashbacks of BEST. My house was not a BEST (a catalouge showroom store–I believe it worked by you saw a display model of something, and there were these cards next to the item that you wanted and you showed this card to someone and they got it out of a storage room for you? Is that how they worked?) house. My mom went into BEST on a last minute shopping trip with my half sister some time in the late 1980’s and she never went back. She said it was the worst store she had ever been to. The reason why I bring up BEST is because last year I was taking an art history class, and way in the back of our 800+ page book there was a BEST storefront that looked like a building crumbling. This building was created by James Wines, and I was telling my retail buddy; Steven about this, and she showed me this link which showcased all of Wines’ BEST store facades. I didn’t know he did more of them. BEST folded in the mid 1990’s (nobody at my house was grieving over it! ), and now the buildings are dying. Most have already been torn down. But I was telling Steven that I can’t imagine anybody moving into these buildings these days. Not even Target or Kohl’s. I can just imagine like storefront churches moving into these buildings. (in fact one is). I’m mad that that Best Buy didn’t leave their building looking like it did when it was a BEST. The Best Buy in Newport News, Va looks pretty out of the box.
" It’s rather sad looking as a Chinese Buffet." I would have never guessed in 2 million years that I passed by what was originally a Howard Johnson’s restaurant in Newport News when I made a five day a week commute to Newport News, VA in 2001-2002. It closed a few years before I was born, though. See the fifth picture down on that page I linked to? That’s my all time favorite building in Newport News, VA. Rouse Tower but I just always refer to it as the “RT” building. It reminds me of when I was a little kid and we’d have to do our shopping trips at night because back then my parents shared a car, and we’d go shopping in that area, and I’d always see that building and some of its lighs were still on at like eight o clock at night. This recently closed Winn Dixie Marketplace (Franklin, VA) shut down in 2005. Judging by this Winn Dixie being callled a “Market Place”, I’m guessing it was built in 1997-ish around the time the Winn Dixie Marketplace in Hampton, VA was built. There’s a “For Lease” sign hanging in the windows. I wish I could have seen this place while it was open, I’m sure it was a nice store. It’s like something from the future, but in the past now? I wish more grocery stores were built like this one was. They’re all just boxes. Winn Dixies came back to Hampton Roads in the mid 1990’s after they died in the 1980’s. Maybe 12 were built. Sometime in 2000 I think, half of them shut down and became Farm Freshses or Krogers. I remember the one in Hampton stayed open until all the Winn Dixie’s in our area went under in 2005. There’s also a closed down Winn Dixie that is being gutted in Williamsburg, VA that I haven’t taken photos of yet. I took two more photos a year later. Saturday Night At The ‘Kar Show! During my years I lived in Hampton, VA (1983 [the year I was born] to 2000) there was this shopping center about 15 minutes away from our house. I think the name of this place was Langley Plaza. It’s anchors were Ames and Be-Lo. And the rest were just dog groomers, hair salons, a karate studio and I think there was a pet store. When Ames closed in December of 1989 or January of 1990, this place died. I don’t remember many details, but I know thae the “Ames” sign stayed on the store for almost ten years! I know the Bi-Lo pulled out some time in the mid 1990’s. This place stayed dead (with just the pet groomer and the hair salon and the karate studio, I think) until 1999 when some people finally came in there and re did the place. It was finished in 2001, and the former Ames was a Food Lion (ugggh—I hate Food Lion, they’re every where out in my parts, and that makes me so angry), and a Sally Beauty Supply was built, and some cheapo clothes store was built. If you passed by there now you would have no clue that this place was a rat hole just seven years ago. Which brings me to the title of this entry. When this shopping center was a rathole, these kids would do Car Shows in the parking lot on Satuday nights. Around this time I was going a tutor for homework help, and the tutors neice was telling us how this guy came up to her one night and told her “You want to go with me Saturday Night To The ‘Kar Show?” in this Bostonian accent. They did these car shows at the Langley Square shopping center until it was redone. I think the cops had to go by there a lot those Saturday nights. I don’t know what ever happend to my tutor or her niece, but “Saturday night at the car show” will always live on with me. It was one of our little inside jokes. "Women have to travel too far to find a good paying job"
Transportation Dead zones ie: deserted malls but new buildings going up next door such as the Power Plant project. Coliseum mall has empty spaces Newmarket Mall is all but defunct and right across the street from the abandonded Kmart shell is an abandoned HQ building and decrepit mall what hasnt burnt down is left as a shabby growth of weeds. Yup, that’s Hampton, VA for ya!! There’s 45 pages of this .pdf file. I got some reading material for tonight. According to my mom, this was originally THE mall in Hampton, VA in the 1960’s/early 1970’s. The Mall part was in the middle of the shopping center, and my mom said that whenever you walked in there, you could smell hotdogs. There was a Montgomery Ward in the mall, and a Roses (a poor mans’ K-Mart) When Colesium Mall opened in the 70’s, Burlington Coat Factory moved into the middle section of the mall. I used to go to the Roses with my parents up until I was 5 or 6 I think. Then I think the Roses had a fire, and then a year later the store closed down. There was a Farm Fresh in a strip mall next to the Roses, and I’m sure it did pretty well until it succumbed to a fire in the summer of 1997 or 1998. 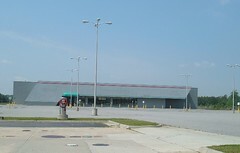 Then the HQ (a local version of a Lowes or a Home Depot) shut down (it was two doors down from the Burlington) and then in 2002 the Circut City (which was next door to Burlington) shut down due to poor sales. All that was left was the Burlington–until Wards closed down at the Colesium Mall in which they moved in, and the shopping center was torn down. I also have an update on the closed down Wellworth Cleaners in Newport News, VA. It’s now some party shop. Yeah, I give that place six months. On the lighter side of sick malls, dead malls, and dead stores, there is a blog about malls that are alive! I gots reading material for the next two nights! JAMES CITY — There won’t be any “Star Wars” in Williamsburg this month. The seven-screen Carmike theater ended its run at the Williamsburg Crossing shopping center Thursday. It was the Williamsburg area’s only first-run movie theater. A steady line of cars pulled up to the theater on a cold, wet Friday night and then slowly edged away when the drivers noticed no movie posters and no lights. Nancy Gloss and her husband drove by to see if the rumors were true. She has operated Nancy’s Bernina Sewing Center at Williamsburg Crossing since the fall of 2003. Carmike closed as construction continues on a 12-screen theater in the New Town development just off Route 199 – one exit away from the Carmike theater’s exit. Charlotte-based Consolidated Theatres hopes its Colonial Cinema will be open by mid-August after wet winter weather caused construction delays. The Kimball Theatre on Duke of Gloucester Street plays independent and foreign films. 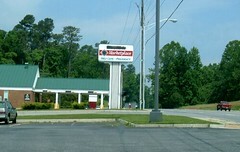 Williamsburg Crossing has lost other business to New Town; the Corner Pocket billiard hall was one of the first businesses to move there. Shoppers now gather at Target or Ukrop’s on a Friday night. The last anchor tenant at Williamsburg Crossing is a Food Lion grocery. Last week the company CB Richard Ellis advertised 17 locations there available for lease. Since I don’t live in Williamburg (but shop/went to school for 2 semesters/worked) in Williamsburg, but never went out in those parts. But the day after I read that article, I had a dream that me and this group of people got on a bus and drove there and took photos. For some reason I always think of the New Pornographer’s Song “Twin Cinemas” when I read this article. So here’s the song. "The 800,000 square-foot mall was shuttered in September, 1979. It has been left standing since. " On the new Family Guy a few days ago Peter and Lois drove through Dixie Square Mall (links : 1,2,3) a-la-The Blues Brothers. I have screen caps.